Animation, cyber theft, shows, record collections, books and everything else you could possibly want to know. 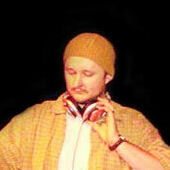 How did the name DJ Vadim come about and how long have you been doing what you do? Well my real name is Vadim so I just added the DJ part. Not too inventive but at the time I though it sounded a little strange so I used it. I have been DJing since around 1988. Loving the cheapness of pressing a few buttons to download entire albums? Or hating the devilish tricks of cyber space? I think both. There are so many cool great gadgets out there all at very reasonable prices to help u make music, get info etc. I would be a liar if I said I had never downloaded stuff for free. However I think now is the time to curtail or police this area more. Your website’s pretty packed with eye candy animation and graphics. What are your favorite animated shows on TV? What sites you hitting up online a lot? You’re a busy guy, even over the days straight after Christmas. What aspects of going live do you get the most out of? Its when people react at shows. The best kick in the world. When people actually take their time out to listen to what u have put effort into. What’s the most recent piece of work you’ve created, of any genre? Well I have just completed 2 remixes – 1 for a Spanish Flamingo group and another for a French experimental rock group. Pretty cool mixes plus I’m making a mix tape and trying to complete my next LP. What’s your favourite record of all time? The last time you read a book was when and what was it? Any good? 1984 by George Orwell. Its incredible. I read it during our USA tour 6 weeks ago or so. brilliant. I have a couple of others to read now including PIMP and the new Michael Moore book. A Paulo Coelho book too. What’s your most memorable set/venue and why? Again so many and all for different reasons. San Francisco – April 2003, Sydney – September 2002, Berlin – January 2003, Barcelona – August 2003. A lot of shows have been getting better and better. When you’re not grooving crowds with your vinyl, what do you do to chill out and relax? Well I am pretty much full on with music all the time. If I am not spinning, I am making it. In terms of what I am listening too at home, I listen to everything from talkÂ shows, pirate radio, classical, rock – Super Furry Animals, Amy Winehouse, Erykah Badu, Task Force, Missy Elliot, Dilinger, jungle…. What’s the thinking behind the title ‘USSR: The Art Of Listening’? There are quite a few ideas and concepts but basically I tried to make an intricate LP which is meant for listening. Like making a fine wine or fine cuisine. I tried to incorporate so many different angles and sounds. This Feburary the likes of Jurassic 5 and Mr Manuva are coming together for the four day long Festival Of Flight which you’re involved in. Tell us a little about that. Well it sounds like its gonna be pretty big. How’d you sum up the entire hip-hop scene in the United Kingdom right now and what are your aspirations for its future? What words of encouragement would you give kids who’d love to go down the DJ Vadim, Shadow and Cut Chemist route, but hasn’t got a room full of gadgets and gizmo’s? Its not about gadgets or gizmo’s. Its about having idea’s in your head and working them out. It doesn’t matter if you have 20 million quids worth of equipment. Look at the charts. It’s full of puppets who aint got a scooby. However on my travels even within the last 12 months I have met so many talented musicians, producers etc working from their home studio’s….People just got to keep on. never give up on their dream. Because u never know what might happen. What projects can heads check out for that you’ve got in the pipe line? In the meantime, what CD’s should we be spending our pocket money on this month? Missy Elliot, Super Fury’s, Erykah Badu, TY, Task Force . Any final words to the readers? Listen to more reggae music!